The huge discrepancy between the reality and public perceptions of benefit fraud legitimates government reforms and backs Labour into a political corner. In an important post on the excellent Inequalities blog, Ben Baumberg analyses data from the British Social Attitudes Survey on public perceptions of abuse of the benefit system. It is well known that the UK public tends to overestimate benefit fraud, but Ben has gone into more detail than most recent analysis, looking at perceived abuse of specific benefits and at the distribution of attitudes across the population. The whole article is essential reading, but one aspect which is particularly interesting in the current context of welfare reform is that Ben looks specifically at perceptions of abuse of disability and sickness benefits. The government is planning to reduce the working age Disability Allowance caseload and expenditure by more than 20%, and changes to Employment Support Allowance are also going to reduce support for hundreds of thousands of claimants. 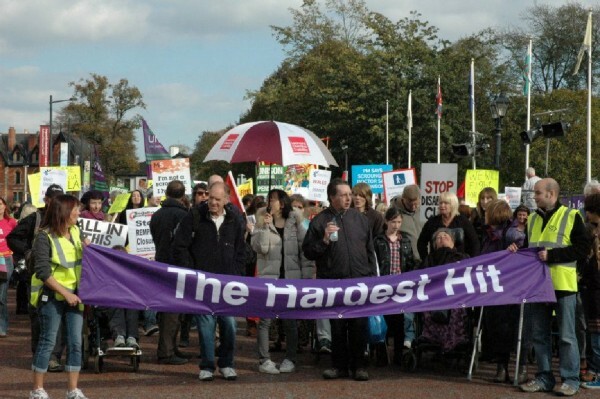 So how does the public perceive levels of abuse of sickness and disability benefits? The results from Ben’s analysis are pretty stark: the average person believes that 30 in 100 disability claimants, and 35 in 100 unemployment claimants, are falsely claiming. Although the survey question was worded in terms of people ‘falsely claiming’ rather than specifically about fraud – and so the results may reflect beliefs about ‘scrounging’ as well as ‘cheating’ – the contrast with DWP’s estimates of fraud is still worth highlighting. For example, the estimated percentage of overpayments due to fraud for people on income support for reasons of disability is 3% (for various reasons, I would expect estimated fraud to be higher for this group than for other groups of sick or disabled claimants). For Disability Living Allowance, estimated fraud is only 0.4%. So the public’s perceptions seem to be not so much inaccurate as completely unrelated to reality. 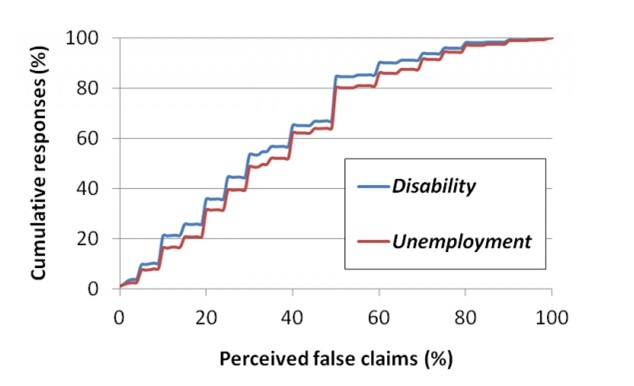 And as the chart below shows, there really isn’t much difference between perceptions of abuse between unemployment and sickness/disability benefits – which suggests to me that people’s reported perceptions turn on a generic notion that there’s a lot of abuse of all kinds of benefits rather than thinking about specific types of claim. Ben’s analysis prompts two reflections on the relationship between social security reform and public opinion. The first is that perceptions of benefit fraud may be conferring a spurious legitimacy on current government policy. Supporters of cuts to social security often use polling evidence to argue that these policies are in line with public opinion. For example, a widely reported survey for Prospect earlier this year appeared to show overwhelming public support for benefit cuts, with 74% of the public agreeing with the statement ‘welfare levels overall should be reduced’. But how far are these results beholden to wildly erroneous views on the level of abuse? If the public thinks 30% of claims are abusive, it’s hardly surprising if they want to see expenditure reduced. But even if it were a valid move to infer legitimacy from polling evidence (which is debatable to say the least), it would be hard to claim that that evidence provides any additional normative support for controversial policy choices if the polling results are based on huge public misconceptions. This is one case where a deliberative democracy approach– in which a representative sample of the public debates issues in the light of full and accurate information – might provide a far better picture of underlying attitudes and values. The second is one that Kate Bell and I raised in a recent report for the TUC. If public perceptions of fraud and abuse of the benefits system are detached from the actual levels of fraud and abuse, then the argument that getting tough on claimants will increase support for social security – an argument associated in particular with Labour – is about as wrong as it is possible to be. It is much more likely that framing the debate in terms of fraud and abuse simply provides an endorsement of pre-existing negative views which are impervious to the detail of policy. There is also the worrying possibility that this framing actually reduces support for social security, as the statements of politicians have a big impact on media coverage. Further evidence from the British Social Attitudes Survey lends support to the latter hypothesis. There may be electoral gains to be made by talking up abuse of benefits, as some Labour political strategists insist. Alternatively, there may not be: Labour strategists do sometimes get it wrong. Whatever the case, Labour should not confuse the scramble for floating voters with building support for social security. Even if the promised electoral gains materialised, there is good reason to believe they would come with a heavy price tag. Furthermore, we should be very concerned with who will wind up meeting the bill. The evidence increasingly suggests that lower public support for social security plays out in increased suspicion and hostility towards claimants, even those who most fit the public’s criteria of ‘deserving’. This leftie website is missing the point. Spending is too high due to Labour trying to buy votes by spending like crazy when they were in power. Now Tories have to fix the problem by reducing spending. So how about hearing some solutions from the lefties to the problem of likely default of the debt in the future rather than the usual leftie criticisms. Give us some solutions for once.